A pea coat (or pea jacket, pilot jacket) is an outer coat, generally of a navy-coloured heavy wool, originally worn by sailors of European and later American navies. Pea coats are characterized by short length, broad lapels, double-breasted fronts, often large wooden, metal or plastic buttons, and vertical or slash pockets. References to the pea jacket appear in American newspapers at least as early as the 1720s, and modern renditions still maintain the original design and composition. A few of the jackets seen on the street are genuine navy surplus; being a classic garment, it is frequently available from retailers, though often with small design changes that reflect the current fashion trends. The standard for historical pea coats was 30 ounces (approx. 850 g) wool, most often made of heavy Melton cloth through the 1970s in the U.S. Navy. Presently coats are made from 22–32 oz (620–910 g) wool. 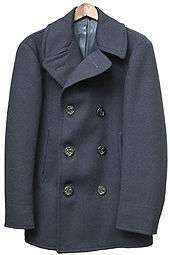 While pea coats are offered in many colors by retailers, the US Navy-issue pea coat is dark blue. 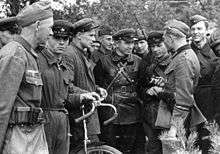 Russian political commissar (centre) wearing double breasted leather coat during the 1939 Invasion of Poland. A black leather version of the reefer jacket was worn by Kriegsmarine U-Boat officers during World War II, including Admiral Donitz. It was also worn with a peaked cap by Red Army commissars, tank commanders and pilots. Christopher Eccleston wore an identical coat when portraying Doctor Who. According to a 1975 edition of the Mariner's Mirror, the term pea coat originated from the Dutch or West Frisian word pijjekker or pijjakker, in which pij referred to the type of cloth used, a coarse kind of twilled blue cloth with a nap on one side. Another theory, favoured by the US Navy, is that the heavy topcoat worn in cold, miserable weather by seafaring men was once tailored from "pilot cloth" – a heavy, coarse, stout kind of twilled blue cloth with the nap on one side. This was sometimes called P-cloth from the initial letter of pilot, and the garment made from it was called a P-jacket – later a pea coat. The term has been used since 1723 to denote coats made from that cloth. 1 2 "US Navy-style Pea ("P") Coat". US Wings Inc. 2008. Retrieved 2007-12-31. 1 2 Josh Williams (2013). "The History of the Pea Coat". Tails. Retrieved 2014-01-07. ↑ Stilson, Sam (2007). "The Perfection Of The Pea Coat". The Soko. Retrieved 2007-12-31. ↑ "§5 Article 3501.41 Peacoat (E6 and Below)". U.S. Navy Uniform Regulations. Retrieved 2009-10-16. ↑ Leonard George Carr Laughton; Roger Charles Anderson; William Gordon Perrin (1975). "The Mariner's Mirror". The Mariner's Mirror. 61: 26.